Available at Etching House, The Bride (Mount Pleasant) by Garry Shead, an original etching by Garry Shead released 8-6-10 with a image size is 60 x 90 cm made on 100% rag paper, the image size is: 79 x 109 cm, there was 15 colours and 2 different plates used to produce this limited edition fine art original etching, this unique collectable etching is in stock at Etching House Now. Etching works on paper by Garry Shead, Garry says that an Etching or an Oil painting are both original works of art, just different mediums. The Bride (Mount Pleasant) is the first of several new etchings coming out of the series. Garry says Etching works on paper they are a great way to make available affordable art works on paper, For this reason Etching House specialises in fine art etching works on paper and have been collecting and dealing since the late 1970,s. Lay Buy is welcome up to 12 months on 20% deposit. 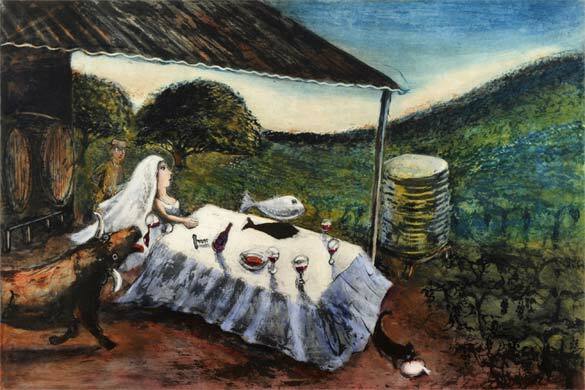 Garry Shead says about his new etching titled The Bride (Mount Pleasant) “This is a picture of what I imagine it was like at the vineyards at Mount Pleasant when my Uncle Maurice O’Shea’s bride sat at the table and surveyed the incredible world she had entered. Although their marriage was not to last, Marcia was the inspiration of Maurice’s greatest wines”. Garry Shead, says it’s harder to make a etching than it is to do an oil painting, Meditating before commencing work on a works on paper etching brings out the inspiration to create. Garry Shead 2010 at Etching House Fine Art.